No sooner than 3 reactionary lunatics had murdered 17 people in France, including journalists on Charlie Hebdo and 4 Jewish people in a kosher supermarket, then Benjamin Netanyahu was on the scene. What was Netanyahu’s message to the Jews of France? To offer comfort, to encourage them to stand up to anti-Semitism, to promise that Israel will in future make it clear that its genocidal attacks on the Palestinians have nothing to do with diaspora Jewish communities? Coubillay - supermarket killerPerish the thought. 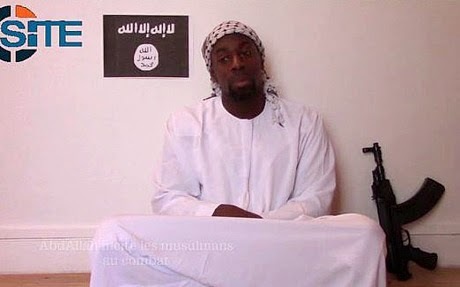 Like a parasitic leech, Netanyahu sought to complete the work of Amedy Coulibaly, who killed the shoppers in the supermarket solely because they were Jewish. The true home of French Jews was Israel, a sentiment that every anti-Semite will agree with. Once again Zionism demonstrates that it is the hand that fits into the anti-Semitic glove. In fact the millions who demonstrated in Paris and elsewhere in France proved the complete opposite. That anti-Semitism has shallow roots today in France. 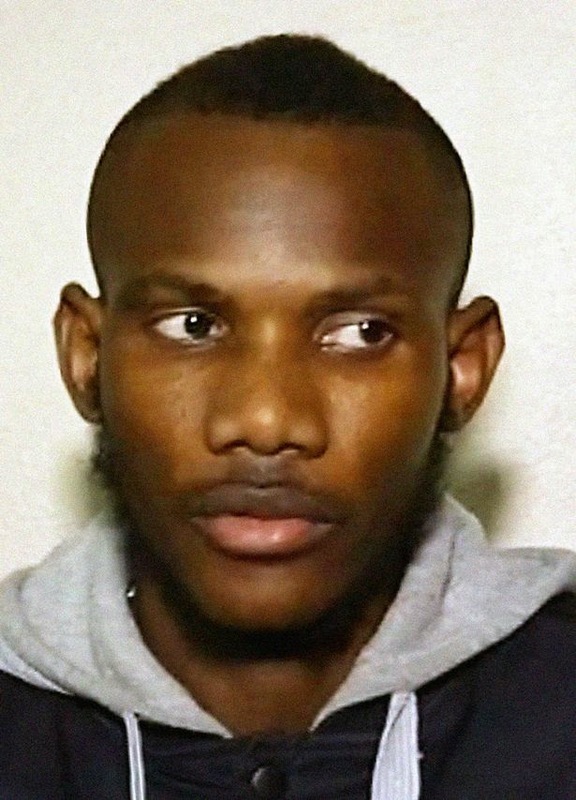 It showed that this is equally true of the Muslim community and the outpouring of praise for Lassana Bathily, who hid Jewish shoppers in the freezers of the supermarket, demonstrates that the mass condemnation of the 3 killers is not a condemnation of Muslims, despite the attempts of politicians such as Nigel Farage, Marine Le Pen and David Cameron to do exactly that. Countries like Egypt and Bahrain torture journalists yet they were welcomed on a march in support of press freedom! Equally hypocritical has been the French government which has used the attack on Charlie Hebdo, not to defend freedom of speech but to restrict it. Palestinian marches have been banned in France and those who attend them face a year or more imprisonment. Clearly the lessons learnt by some in the West is that freedom of speech is only worth defending when you agree with them. I am confident that despite a spike in the emigration of French Jews to Israel (it is estimated that 10,000 will go this year) that the vast majority of them will stay. After all, there is no more dangerous place on Earth if you are Jewish than Israel. The newly formed Zionist group, Campaign Against anti-Semitism, has been quick to exploit the situation, too quick. It took to using a rigged poll, in which people were invited to say that today's Britain reminded them of the 1930's (it is doubtful that many of the respondents were around then or even know what it was like) and half agreed. Likewise the finding that a quarter of British Jews are thinking of moving to Israel is another piece of invented nonsense. The Jewish Chronicle opinion poll 'JC poll reveals 88 per cent of British Jews have not considered leaving UK' which was scientifically valid, shows that 88% of Jews have no intention of leaving the UK. No doubt this is very disappointing to the Zionist fanatics of the CAA. It is also no doubt disappointing to the rank opportunists and hypocrites of the Tory-Lib.Dem. government, not least our very own racist Home Secretary Theresa May. She took advantage of the CAA poll, knowing nothing about it or its defects, to suggest that she was shocked that Jews were considering leaving Britain because of anti-Semitism, just as her fellow Cabinet member, Eric Pickles, was asking Muslims to prove that being a Muslim was compatible with a British identity. Once again 'anti-Semitism' is being used in pursuit of a racist agenda. In the past several days we have experienced the same repeated shocks as all our fellow citizens. As Jews we were profoundly upset by the horrible attack carried out on Jews only because they were Jews. This can only evoke memories of the worst periods of Judaism in France. All we believe in as activists, citizens, and human beings, and all that we struggle for – the value of life, equality among human beings, and ta’ayush (living together) – was trampled in the editorial office of a magazine and in a kosher market. We are convinced that freedom of expression is a fundamental value of any democratic society and that it must be defended at all costs against obscurantist violence. 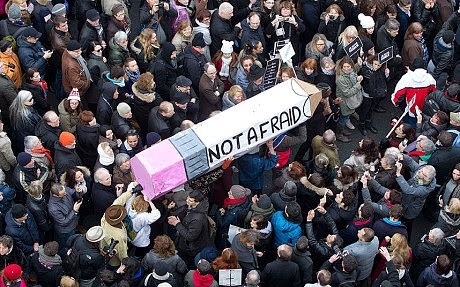 We are also conscious of the rise of a formidable anti-semitism in France. But we seek to analyze it and understand its causes, because like all racisms it breeds blindness, hatred and bloodshed. For years our association has been denouncing the trap set for French Jews and it is important to describe this trap again in the wake of this murderous attack. This trap has been laid by several different instances, at several different levels, yet not without coordination. It began with Ariel Sharon’s provocations on the esplanade of the al-Aqsa Mosque, which unleashed a second Intifada in 2000. The Israeli government decided that France, which is home to the largest Jewish community of Europe, was a necessary and indispensable tool of its policies. The executive arms of these instances in France was made of the Israeli embassy, the Jewish Agency and the CRIF, that is, the so-called representative council of Jewish institutions in France. Their aim is to embark all Jews of France in a current of unconditional support to all actions of the Israeli government, including the worst. The CRIF seeks to impose the image of a totally homogeneous Jewish community in full support of a flawless Zionism and unequivocal support to the regime’s actions. The same mission is then pursued within the network of secular Jewish associations, from which our organization was bound quickly to be ejected because the orthodoxy says there is no salvation outside Zionism. To imagine a collectivity of nearly 600,000 French Jews speaking with a single voice is just as stupid and insane as attributing a similar unanimity to five or six million Muslims, among whom there are, obviously, religious observers, secular or otherwise and in varying degrees, and even a few friends of Zionism! Such reasoning promotes the assimilation, in everyone’s mind, between Jews and support for Israeli policy whatever it may be. And this is policy which occupies, colonizes and kills Palestinian Arabs every day. Israel’s successive governments have addressed themselves over the same period of time to French Jews, urging them to leave France, with all its supposedly anti-semitic Muslims, and make their aliyah to Israel. To complete the picture, there is a family of French intellectuals who espouse a “clash-of-civilizations” view of the world. Caroline Fourest, Pierre-André Taguieff, Jacques Tarnéro, Alain Finkielkraut and others lead the charge both against Islam and for Zionism. Successive French governments, for their part, have continually confused legitimate criticism of Israel and Zionism with anti-semitism and racism. Most French media have taken up the same chorus. After the massacre of Toulouse in March 2012, one could even hear some journalists who, when speaking of Israel to Jewish citizens of France in front of the school targeted by the assassin, called it “your country”. And let us not forget the Rufin report on racism and anti-semitism (2004), which called for penalization of anti-Zionism, described as a new form of anti-semitism. Into this trap, many Jews have fallen, given their emotional and familial ties and their identification with Israel, and given Israel’s history as presented in Zionist mythology. Little by little they have become the potential “representatives” in France of the Israeli soldier or the Israeli settler, abandoning their critical judgment in the heat of increasingly problematic confrontations. They have at the same time sacrificed their own capacity for empathy with others, including occupied peoples, people deprived of all their rights and subjected to massacres as in Gaza last summer. Their only concern is to preserve at any cost this “small, fragile state surrounded by enemies” and alone capable, they believe, of protecting them from anti-semitism. Any criticism of that state has thus been defined as an act of anti-semitism; any meeting in solidarity with Palestine becomes a gathering of fanatics who are seen as a threat to them personally. Local Jewish communities, at the urging of the CRIF, have thus tried to prohibit such meetings, thereby reinforcing the animosity against themselves. The vicious cycle is only reinforced over time; each new attack on the occupied territories only worsens the tensions and contributes to the syndrome of sectarian withdrawal. In these same years, the social crisis has deepened in the working-class districts where Jews, Arabs and Africans could often be found together in the same public housing, confronting similar difficulties. In these ghettos of poverty, the young French post-colonial citizen who undergoes job discrimination and is prevented from entering certain night clubs because of his physical appearance, tends to identify with that last non-decolonized pocket of the Arab world – oppressed Palestine. Sometimes he wears the keffieh, a symbol of resistance. Each time he seeks to express his solidarity, his free speech is infringed upon and assimilated to anti-semitism. And do not wearers of skullcaps also often bear the insignia of the Israeli paratroopers? They can demonstrate without fear their support for the Israeli army and its massacres in Gaza, and can even take part in those actions – the French government and the national press will say the same nice things about him as about “Operation Protective Edge”. They’re on the side of the good guys’: they’re white and western and have the law of the strongest in their favor. Violent groups such as the Jewish Defense League may insult Palestine and Arabs, beat them up and commit acts of vandalism and never be brought to justice; the police just watch them and remain silent, as we witnessed in July 2014 near the synagogue on Paris’ rue de la Roquette (there are plenty of videos to prove what actually occurred). At the same time young Arabs were not allowed to demonstrate for Gaza. We cannot forget that young man who was arrested – like others, on the basis of his appearance – while on the sidelines of a demonstration this past summer and as he was leaving for home, simply because he was wearing a keffieh? He was struck by a police office and was sent immediately to a hearing before a judge. A journalist from Libération, witness to the scene, saw the young man break into tears before a partial and inflexible judge and wrote an angry article. The young man was sentenced to three months in prison and it still today under house arrest with an electronic bracelet in his outlying suburb. The French justice system operates with a double standard: stigmatization for some to the dubious benefit of others, thanks to an official discourse which depicts the Arab world as the backward, barbaric, terrorist Axis of Evil, while Israel is a model of democracy; young Arabs and Africans are painted as potential dangers to society while Jews are a protected category, fully integrated into a West recently redefined as Judeo-Christian. Here too is a source of anger. The powerlessness of those unable to transcend their miserablecondition has sent hundreds of youths of all horizons – even a handful of Jews it seems – into the arms of IS and al-Qaeda. Thus the trap closes shut. Jews, reduced to a homogenous body, will be taken to task for all these injustices, humiliations, muzzlings, and all that arrogance displayed while under the protection of successive French governments: don’t touch our Jews, you eternal foreigners, you barbarians unassimilable into our republic. If you can’t harm Israel, some tell themselves, at least you can try to harm its Jewish supporters. The festering wound of the Palestinian question, unresolved because the powerful of the world refuse to resolve it, contributes to the emergence of a desperate and suicidal terrorism. A powerful mechanism for assigning people to their supposed identities of origin has arisen in the context of the post-1989 world. The Jews of Europe, and those of France in particular, have served as footsoldiers in this new formation. It is with a sense of gravity that we undertake to remind our fellow Jews that we are French; we can live at home here and be “happy like Jews in France” (according to an old saying transformed by historian Elie Barnavi), and we can achieve this happiness with our fellow citizens of all origins. The importation of the Israeli-Palestinian conflict is of your doing because you have been manipulated into serving an unjust cause. The rising terrorism of IS and al-Qaeda, against which we must all struggle because it is a murderous and suicidal dead-end, will require us to wage struggles in common against all forms of racism and exclusion and for the expression of opinions in all their diversity – including those of Muslim and Jews – in a spirit of exchange and dialogue. Freedom of expression cannot be limited to a single world view. ‘… the claim in the report, for example, that “more than half of all British Jews feel that antisemitism now echoes the 1930s” verges into irresponsible territory – it is an incendiary finding, and there is simply no way to ascertain whether or not it is accurate. Moreover, the very inclusion of such a question in the survey, which most credible scholars of the Holocaust utterly refute, was a dubious decision in and of itself, and raises issues about the organisers’ pre-existing hypotheses and assumptions. Professional social researchers build credible surveys and analyse the data with an open mind; the CAA survey falls short both in terms of its methodology and its analysis. The second survey, conducted by YouGov, is much better – the results are certainly broadly representative of the UK population. …. These British Jews, alongside their neighbours, defeated the Nazi-affiliated British Union of Fascists, who wanted to free the country of foreigners “be they Hebrew or any other form of alien”, dispersing their three thousand-strong rally. Jewish workers ensured the “Blackshirts” were the only aliens on British turf. The so-called Battle of Cable Street took place in 1936. Yesterday, the Campaign Against Anti-Semitism claimed that more than half of Jews believe anti-Semitism in Britain now echoes that decade, the 1930s. The survey reported that almost half of Jews fear they have no future in Britain, while a quarter have thought about leaving the country. The findings depict a Jewish community of fear and fatalism, but they worried me for another reason. They demonstrated a disconnect between a particular perception of Jewish life — and the lived experiences of most British Jews. I was not alone. Yesterday, British Jews publicly rejected the “Fortress Judaism” narrative and the self-definition of Jewish life through perceived danger and discrimination. 77% of us have witnessed antisemitism disguised as a political comment about Israel. 82% believe antisemitism is fuelled by biased coverage of Israel. 84% find boycotts of Israeli businesses intimidatory. Powerful statistics to add to a press complaint or meeting with the local police about a boycott protest. In the summer of 2014, as Israel and Hamas battled, all over the UK antisemitic chants were bellowed at protests, boycotters threw kosher goods out of supermarkets, Jews were assaulted and intimidated in the streets and social networks were used to regurgitate ancient antisemitic prejudice. Antisemitic incidents in Britain reached their highest recorded level. London alone saw its worst ever month for hate crime, 95% of it antisemitic.